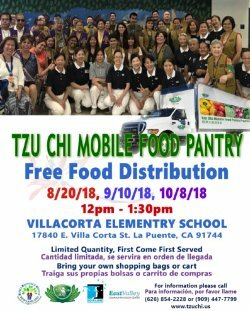 The Rowland Unified Family Resource Center is excited to partner with the L.A. Food Bank and the Tzu Chi Foundation to provide a free Mobile Food Pantry for our families in need across the District. Every month we give away fresh produce and food to all community members who meet the income guidelines. The next Mobile Food Pantry dates will take place Tuesday, November 13 from 12 to 1:30 p.m. at Villacorta Elementary School, located at 17840 E. Villacorta Street in La Puente. Please bring your own shopping bags or cart. Food will be given on a first-come, first-served basis. The December date will be Monday, December 10 at Villacorta. For more information, please call our Family Resource Center at (626)854-2228.